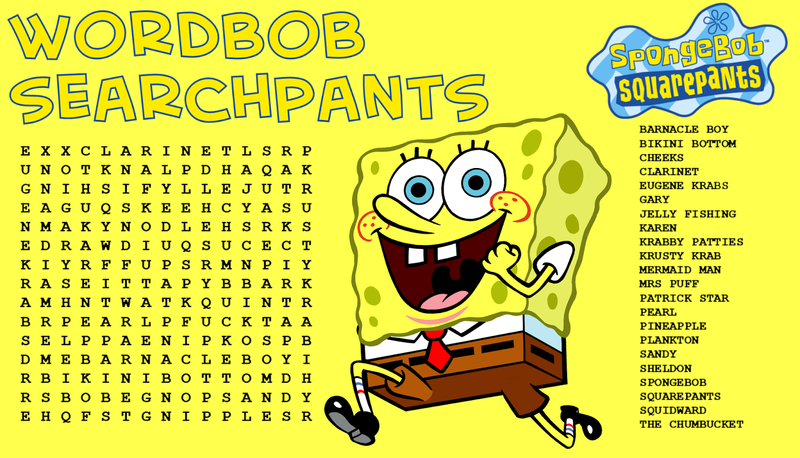 The word-search was found in the SpongeBob section of their website, which ranks in the top 1000 websites visited by Americans, most of which are pre-teens. Angry parents who actually took the time to supervise their kids' online behavior complained to Nickelodeon and Nick.com who immediately took down the offending word puzzle and issued the following apology. "We at Nickelodeon have a longstanding reputation for delivering high quality entertainment and education to children over many generations. We are exceedingly sorry for the gross oversight in the quality of our online programming and have launched a full internal investigation in order to find the root of this problem and to ensure that it never happens again. There that should keep those fuckers quiet." So.... while you were solving the word-search, did you find the offending words which caused distress to dozens of parents? If you didn't, then we have done the hard work for you. Just check out the image below. Did you find them without help? I doubt very much that this was an oversight, it seems more like a malicious attempt to embarrass Nickelodeon by a disgruntled soon to be ex-employee.